Backshelf Concession Trailer Type I - These hoods sit close to the cooking equipment allowing for lower exhaust rates for smaller hoods. They are a Type I Hood and are shorter in height and depth than a canopy hood. We can also supply your concession trailer with diamond plate flooring, stainless tops, sinks, shelving, cabinets, quilted stainless, etc. Grease Hoods Type I - Hoods used over cooking appliances that produce heat and grease laden effluent. These type of hoods come in a variety of sizes and have various options. Exhaust Only Canopy Type I - These hoods have no internal make-up air plenum and the supply air is introduced through ceiling diffusers or external supply plenums. Low-Profile Type I - These hoods are the perfect solution for low ceilings as well as light and medium duty cooking applications. 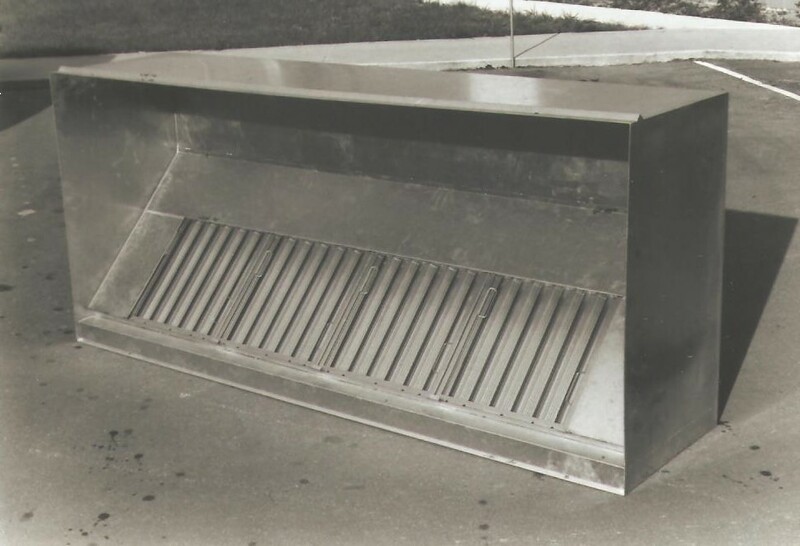 Island Type I - Hood with a V-bank design which promotes efficient capture and containment in island cooking applications. These hoods are used over one row of cooking appliances where no walls exist and can be seen from all directions. Heat and Condensate Type II - Hoods designed to capture heat and/or condensate from non-grease producing appliances such as ovens and dishwashers.